Here's a sweet little touch that I thought I'd share with you all! Obviously I'm talking about the 'Duke' lettering! £1.99 each from Halfords here in Blighty. I'm quite chuffed with how they look, and now everyone 'round here can put a name to that Cruiser that looks so much better than their car! Good ole Halfords', remember them well. Spent 13 years in Harrogate. They have places here in the states that do custom lettering also. Chrome and other colors. For a while i was looking in to changing the lettering around to say something else (limited edition into something a little better) I think thats an anagram? I like the lettering you used on your pt! looks good! 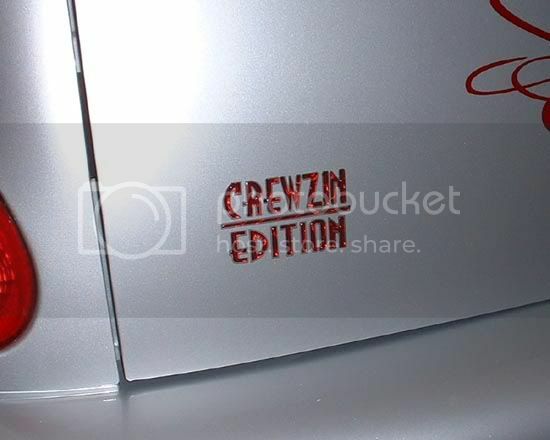 You too Crewzin! Is it me, or are you a Captain in the Navy?! It's not often I bother looking in Halfords, but when I needed some oil, they were the only place locally that sold the stuff recommended in the Owners Manual. Damn glad I had to go in there now! I think naming your car gives it a touch more personality - even though I've been derided in the past because apparently 'girls do that'! And who do you thinks the Naval Captain, ucantcme? 'cause if it's me, you're waaaaay off base! Nice lookin' car though! Yeah, sorry. I was talking about Sooner. I have the same DOD sticker on my car except with an E-9 sticker, lol. Those DOD stickers are for anyone that has to go on a base. I had one for 32 years when I was working for the Dept. of Defense at Ft. Meade Maryland. They wanted to stick one on my cars now because I go down to McDill AFB here in Florida but I didn't want to plaster the PT or Vette with the sticker so I just show an ID card at the gate. Well my dad was in the military, and if you didn't have a sticker on your car - You couldn't get on base. Sooner has the Eagle insignia so I just figured he was a Captain.